Spring weather is here! The longer days and warmer temperatures put people in the mood to start an exercise routine. This is a great time to look ahead for fun activities to take part in throughout the year. 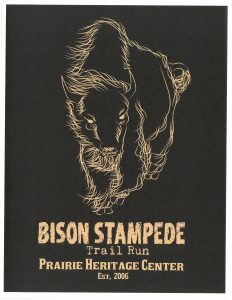 In August, the O’Brien County Conservation Board will be hosting a Bison Stampede Trail Run. Mark your calendar for this 5K event on Saturday, August 10. Walk or run through the beautiful prairie! Registration from 6:30 a.m. – 7:15 a.m.
Race is sponsored by the Little Sioux Valley Conservation Association. Registration and t-shirt pickup for the race will take place at the Prairie Heritage Center from 6:30 until 7:15. Pre-registration is encouraged. The race will be run on the trails around the Prairie Heritage Center and on adjacent property. Be prepared for uneven surfaces. Make checks payable to the Little Sioux Valley Conservation Association. No refunds will be given. Registration received by August 1 will be guaranteed a t-shirt. A limited supply of shirts may be for sale on race day.